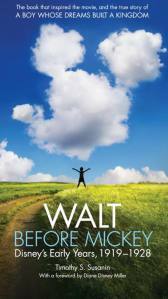 A wonderful interview with Producer/Writer of Walt Before Mickey: Arthur L. Bernstein! Walt Before Mickey is a movie based on a book of the same name by Timothy S. Susanin. It’s the only movie approved by the Disney family and even has a forward by Walt’s daughter Diane Disney Miller! It tells the story of Walter (Walt) Elias Disney’s Early Years, 1919-1928, from his days in Kansas City, MO, at Laugh-O-Gram Studios to Los Angeles, CA, and Disney Brothers Studios, now known as Walt Disney Studios or the Walt Disney Company. The tentative release date is April 18 or 19, 2015. It’s rumored that it will show at the Tribeca Film Festival that weekend. This entry was posted in Uncategorized by My Disney Cloud. Bookmark the permalink.